. . . beautiful, lilting music . . . Voces8 performs with a small chamber ensemble (violin, viola, cello, harp, piano and celesta). It's a perfect match . . . It is music of stunning beauty . 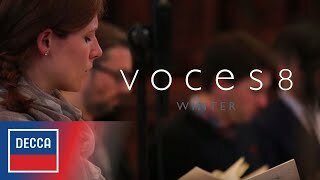 . . choral music is not for funerals or old people, and Voces8 is proving that. Voces8 has produced some exceptional albums, and this may be the best of them. The centrepiece is a stunning performance of Peteris Vasks's "Plainscapes" . . . with important roles for violin and cello, played here with tremendous verve by Norwegian siblings Mari and Hakon Samuelsen . . . especially in the final section, when a cinematically vivid aviary bursts into life . . . Francis Pott's perfectly poised "Balulatow" bears many repeated hearings, as does Judith Bingham's "The darkness is no darkness" . . . Finest of all, though, is Rebecca Dale's specially commissioned title-track, "Winter" . . . this warming masterpiece will definitely see me through any hivernal hardship. Atmospheric seasonal repertoire, superbly sung.
. . . a particularly beguiling version of "In The Bleak Midwinter" . . . the centrepiece is Peteris Vasks' "Plainscapes" trilogy, with the vocals establishing a white-out landscape into which, halfway through the third section, arrive a small pack of wolves, evoked through imaginative touches of cello and violin. Magical.
. . . gorgeous harmonies and sonic textures to warm the long, dark days of winter.